Being a leader in providing Industrial PC based Automation and Data collection solutions in Malaysia, Edex Technology would like to share with you again on the demonstration that we set up during our past event. 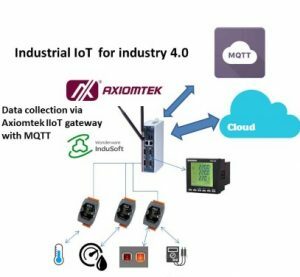 This is something to do with the industry 4.0 where Smart data collection and smart manufacturing can be achieved by using Axiomtek and ICPDAS’s solutions . We demonstrate Axiomtek IoT gateway running embedded indusoft with the capability of collecting data from the Remote Io Modules. the Gateway uses the build in LTE module to connect to internet and also the MQTT broker. Base on the publish and subscribe way of data integration over MQTT , We can use mobile phone to connect to the shop floors device live. The response time time is within seconds. To get to know more about the products and solutions. Please do not hesitate to reach us KL +603-77733908 or email to us a info@edex.com.my we will get back to you as soon as we can.